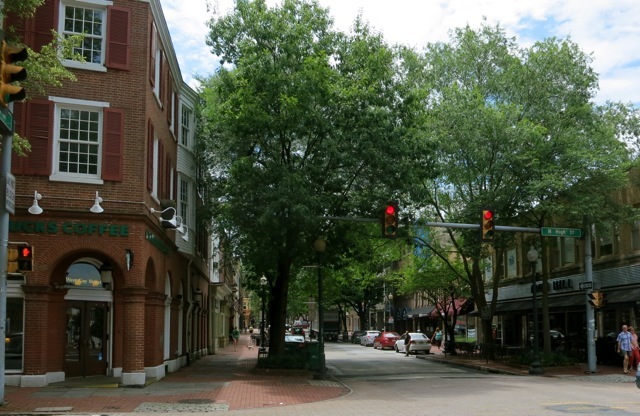 A university town, this main street, shaded by old growth trees, is so charming it stole a whole scene in the movie. QVC prides itself on not merely selling products, but building relationships; this multi-national corporation wants customers to love the products, talk about the products, and be 100 percent happy with the products. And if not, to find out why. I'm the first to admit that I'm not a shopper, I've never watched a shopping channel and yet, after a behind the scenes tour of QVC, I admire the old-fashioned, quality-is-key, customer-is-king emphasis of this multibillion-dollar virtual mall. 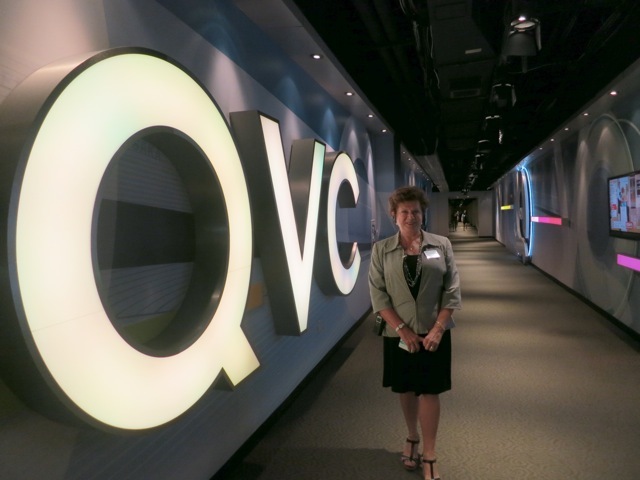 As the world's leading multi-media retailer, QVC streams live on TV and online, to about 100 million homes in the United States 24/7. (Worldwide, twice as many.) And with 20,000 square feet of space, it's the largest television studio on the east coast and the largest live studio -- truly live, with no delays -- in the country. Incredibly, all the action takes place in a little college town, 30 miles outside of Philadelphia, Pa. The acronym QVC stands for Quality, Value and Convenience, but at least one spouse of an addicted shopper calls it "Quick Vanishing Cash." Say what you will about the gauche materialism of our day, there is no disputing that QVC, purveyor of $8.5 billion worth of goods per year, is quite the undertaking, and no group of people displays more panache and fun while doing that than the hosts and celebrity presenters of QVC. Jimmy Fallon, 50 Cent, William Shatner and James Taylor have hawked products from these studio sets, some even taking calls and conducting online chats. QVC relies on celebs and product developers to serve as guest product experts. Joan Rivers has a regular gig and Justin Beiber caused chaos when he came through QVC doors and tweeted that fact out to his millions of followers. Most of the 2,300 QVC employees in Pennsylvania never show up on air, unless they inadvertently walk cross-camera, as shown in a hilarious blooper roll. It is live TV after all. One hundred merchandisers roam the world in search of superior goods; stamped with a QVC seal of approval, the company goes to great lengths to guarantee quality, testing each product to assure that it works well and that it can be packaged and sent to eager buyers countrywide without breaking. And of those products chosen, only 52 percent will have their 15 minutes of fame on TV. Other employees work the phones, maneuver robotic and hand-held cameras, analyze sales and call data second by second, field questions and comments, and feed all this back to on-air hosts who are constantly apprised, through ear mikes, of units sold, what sales tactics are working best ("whatever you said a minute ago, say it again! "), and alert them if a product is selling out. Viewers tweet, chat and post to Facebook in real time and often form the course a sales-pitch will take. 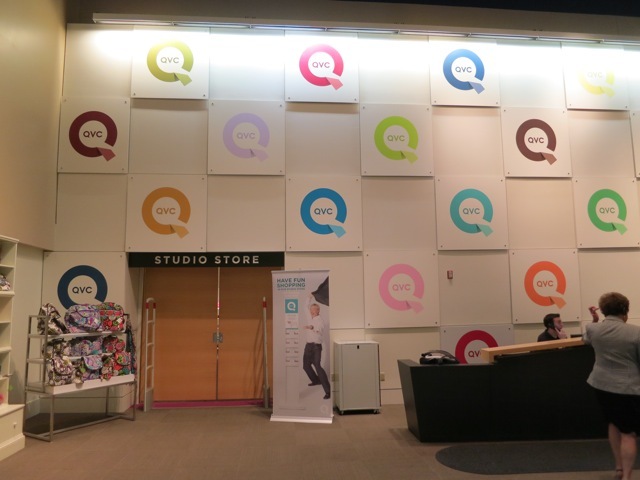 Millions of people contact QVC through phone and computer, but there are several ways to get a firsthand look at this unpretentious billionaire of a business, should you find yourself in this part of the country. 1. A one-hour guided studio tour ($7.50) introduces you to what goes on while the cameras roll. Popular with tech nerds, business, fashion, merchandising, and communications students and of course, fans of the show, guides like the bubbly, knowledgeable Anne Driscoll take you though observation galleries above the network of sets and within reach of NASA-like production rooms. 2. Celebrity hounds will want to check the QVC website for a schedule of when their particular heartthrob will be touting his/her goods for a live audience. There are only 140 seats in an intimate theater setting and tickets are free, but as you can imagine, they are gone as soon as they become available. 3. For the ultimate QVC experience, however, go not only behind the scenes but practically in them. Every Friday, a three-hour "All Access" Tour ($75) brings you down to the studio itself, into one of several Green Rooms, and on live sets where you've got to move quickly and talk in whispers and sign language. You'll bounce from set to set to see how much prep work goes into each segment. Your tour ends with lunch in the commissary with some of your favorite presenters. One-hour tours daily at 10:30 a.m., Noon, 1 p.m., 2:30 p.m. and 4 p.m., $7.50. There are two three-hour all Access Tours offered every Friday; from 9 a.m. to noon and noon to 3 p.m. These are incredibly popular, and reservations are a must. What else is there to do in the area, you may ask? 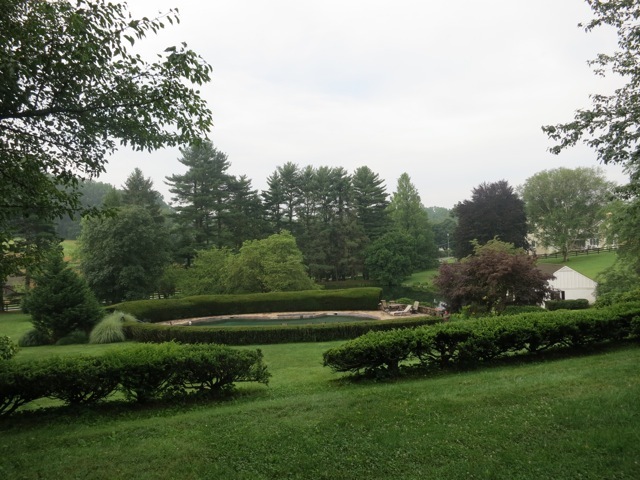 Of course, there's Longwood Gardens, which are gardens the way QVC is a shopping mall, and the multi-generation Wyeth (NC, Andrew and Jamie) museum and studios, Brandywine River Museum. But there's also a quirky place a stone's throw from your car in the QVC parking lot -- the American Helicopter Museum. You can't miss this museum. It's the hangar with several large copters in front and screaming school kids making a beeline to those they can sit in. As the former MBB Helicopter Manufacturing Co., it explains why the Bells, Cobras, Boeings and Sikorskys look so at home here. The oldest is a 1946 Sikorsky S-51 the coolest, a tilt rotor Bell Boeing Osprey flown by the marines. Helicopter rides are available every other month (look online for schedule), and cost just $40 for a seven-minute ride. Not bad for a view of this beautiful region. Wed-Sat. 10am-5pm, Sun 12-5 p.m., $10 adults, $8 kids. 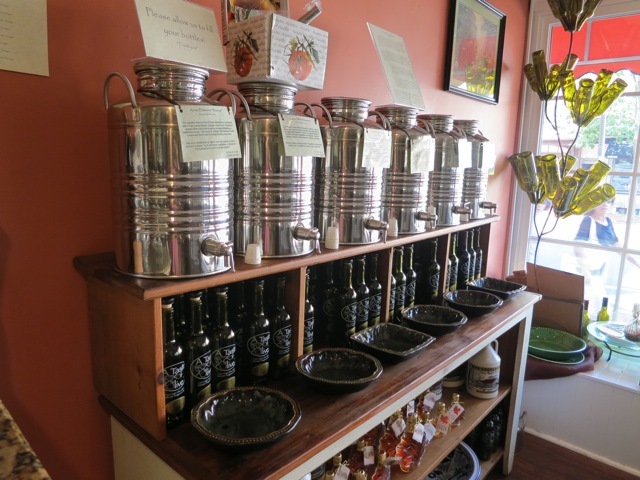 You'll also want to stroll, shop and eat in Downtown West Chester. A university town, this main street, shaded by old growth trees, is so charming it stole a whole scene in the movie Marley and Me. You might be surprised to find world and regionally renowned shops like Eclat, regarded as "Best Chocolate" by Bon Appétit Magazine and called "Celebrity Chocolate" by the New York Times, A Taste of Olive with a bounty of infused oils and vinegars, including rare white balsamics, and Kreutz Creek Vineyards Tasting Room, which offers up sweet, light Port. (Here's a pretty impressive chocolate fondue: melt a pound of premium dark chocolate and mix with half-bottle of Kreutz Creek Port in a fondue pot. Instant raves). For a bit of U.S. history, try the Lincoln Tea Room, a former print shop where Abe Lincoln authored and copied his own biography in 1860 (considered the reason he became so popular before being elected). 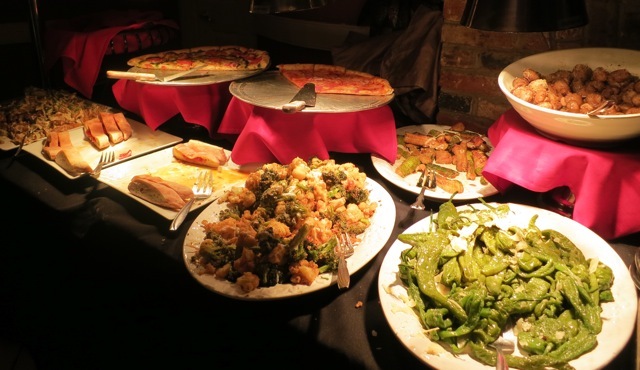 There are plenty of restaurants, but you can't beat Limoncello for its substantial $10.95 Italian buffet lunch with plenty of salads, fish, meat and fried and sautéed veggies. But save room for dessert; the signature frozen "Flute" dessert is the perfect cool and light finish to a hearty meal. With all this to do, you'll certainly want to stay nearby, right? The Warner Hotel, right in downtown West Chester, pays homage to its former life... as a movie theater. The Desmond differentiates itself from the rest of the corporate pack with four-poster canopy beds in each room. Connoisseurs of luxury country inns will love Inn at Whitewing Farm where former stables and tack rooms have been polished and fashioned up for overnight guests -- with made-to-order breakfast and round the clock snacks complimentary with each room. For more about these accommodations and more recommendations about what to see and where to eat and stay in Brandywine Valley, Pa., go to GetawayMavens.com.